It’s safe to say that the Northeast got a little bit of snow this winter. Blizzard after blizzard after blizzard after blizzard — hold up, I’m almost done — after blizzard after blizzard… it was enough to shut down the city of Boston for a month and seriously put a damper on everybody’s plans. And, if my neighborhood was of any indication, it also put a damper on the plow guys’ mood. After the first blizzard, two of my neighbor’s mailboxes were knocked clean off their posts. After the second? Mine joined the list of the (literally) fallen. There really wasn’t much that could be done. By then, the snow banks were easily three feet high and installing a new mailbox would have been downright impossible (or, y’know, really, really tricky). 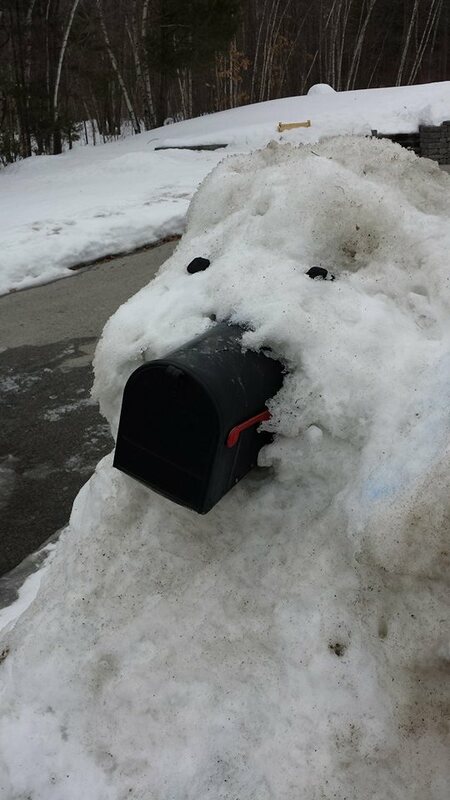 I propped the mailbox on top of the snowbank and wondered what I was going to do about this situation. Thankfully, Mother Nature supplied an answer by giving us more of what we already had: snow. After the third blizzard, snow banks were practically shoulder height (and, given how tall I am, that’s a lot of height) — enough that it covered our broken, propped-up mailbox. And I had seen enough Buzzfeed articles about all the fun ways you could make a snowman. I knew exactly what I needed to do next. I grabbed some charcoal, a baby carrot, some twigs and — just like Anna and Elsa — I built me a snowman. 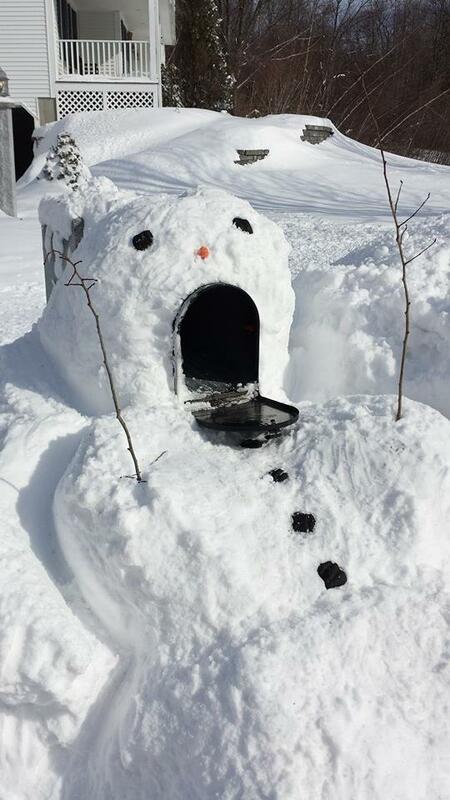 No, not just any snowman: snowMAILBOXman. 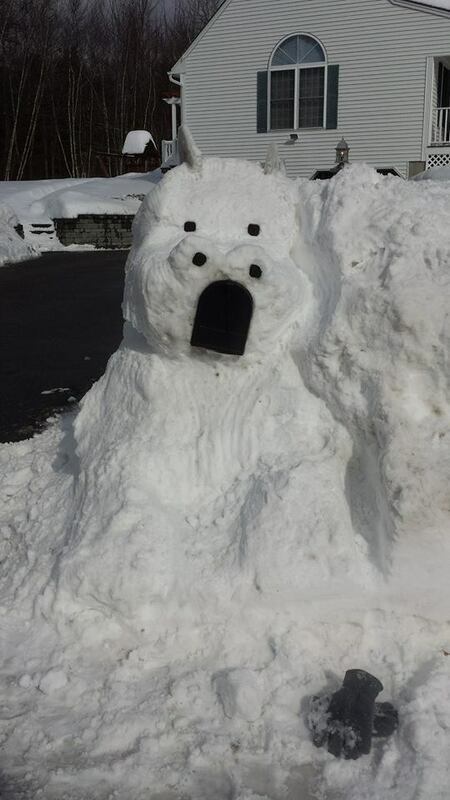 Carved out of an absurdly tall snowbank, looking like he was in distress or shouting “GOOOOOOAL!”, Snowmailboxman kept our broken mailbox in place — while providing amusement to our friendly neighborhood postal carriers (and the people on Facebook, because, seriously, how can you NOT do something like this, and not then immediately show it off on social media?). Within the week, we were hit with yet.another.blizzard. And — for those who had been paying attention to the weather up around these parts — you know exactly what happened next: yet another blizzard. And, while the world (and by “the world”, I mean “the northeast” because the rest of the globe is irrelevant for this story) was put on hold yet again, Snowmailboxman had yet another opportunity to rise from the ashes — er, snow. This time, with an extra half foot of snow on his head — perfect for, say, a mohawk — Snowmailboxman turned into PUNK ROCK Snowmailboxman. Which, really, given that Boston essentially no longer had a public transit system, people were crashing their cars left and right, and cities were genuinely running out of places to put the #$%&ing snow, there was a lot of anarchy going on in the New England. Armed with an old spray bottle, some leftover Easter dye tabs, and the incredible irony of using a springtime activity on a snowman, I created Stay Puft Marshmallow Snowmailboxman. As the snowbanks got higher, his name got longer. I was going more for a ferocious dragon, guarding over the place (and our mail) with steel resolve. Instead, I got more of a cross between Falkor and a husky puppy. Even when I added the scaly back, he was not ferocious so much as he was adorable. 1) Adorable dragons can still be really good watchmen. 2) Who DIDN’T want a luck dragon growing up? I mean, honestly. So now, after six or seven blizzards, I had a 5-foot-high frozen luck dragon guarding my house. Meanwhile, in Alaska, the Iditarod was rerouted due to a lack of snow. Because God has a sense of humor and the Platypus is not the only example of this. 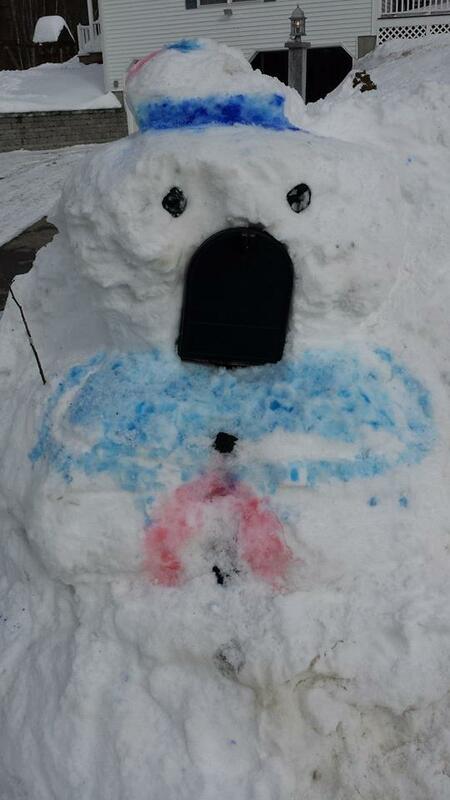 It didn’t take long before Snowmailboxman man went the way of all snowmen — with the exception of Olaf, of course. The snow melted until any hint of a snowman was gone. I wasn’t sure which was sadder: the loss of Snowmailboxman, or the loss of what was holding up our mailbox. Three bungee cords is a sad replacement for the multiple reincarnations that was Snowmailboxman. And I can almost guarantee you that it’s less amusing for the postal carriers. 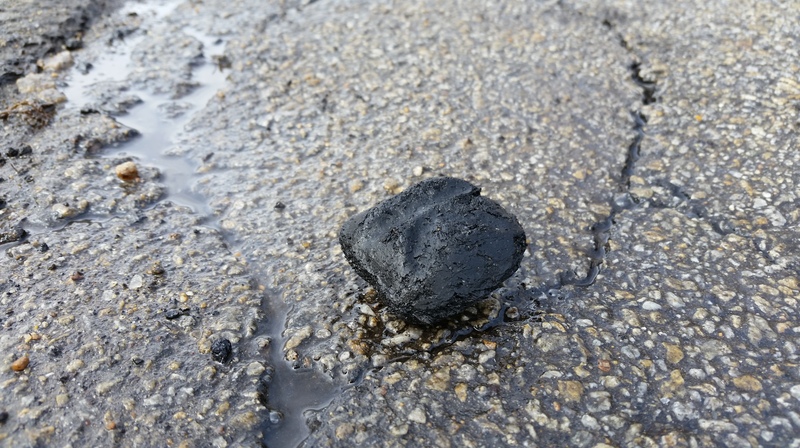 I found a piece of charcoal by the edge of my driveway — perhaps a coat button, or an eye, or a dragon nostril. All that remains of the once legendary Snowmailboxman. The girl with the beginnings of a sleeve tattoo asks this in earnest to the man next to her. She and her girlfriend sit behind us on the plane, their pop-up tent in the carry-on compartment directly above us. They plan on finding a spot on the beach to spend their nights here. The girl with the sleeve has never been somewhere tropical and the girlfriend is excited for the adventure. How cute — qué linda. Any athletic endeavor comes with a risk of injury. 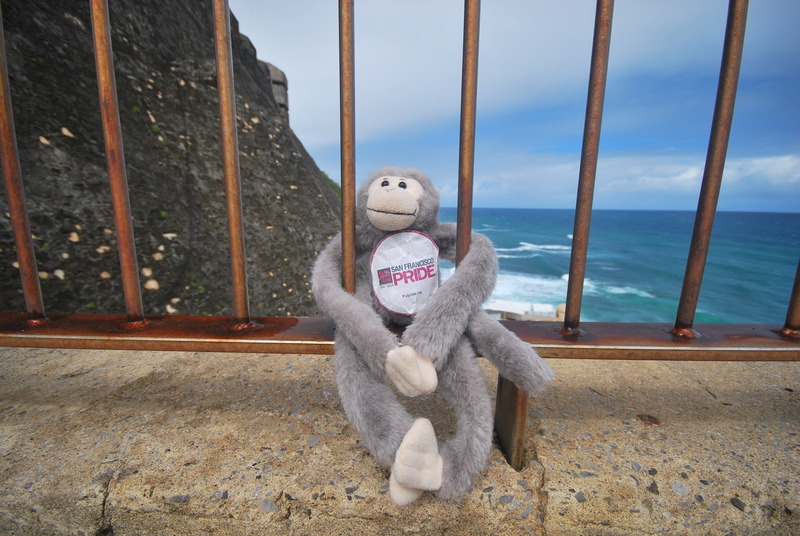 If you do any type of martial art, that risk tends to be a bit higher. You could be participating in something as innocent as cardio kickboxing; there’s still a chance you’re going to walk away with some black and blues (or white-and-golds … are we sick of that stupid dress, yet?). But that’s what you’ve signed up for. No one wants to get injured, but — c’mon — even people who swim laps sometimes chip their teeth. I make no small fuss about the fact that I love my own martial art endeavors. During the intense circuits or bag-training, I may or may not imagine myself as Ronda Rousey in a fight camp (let’s be real — I do. I always do. Especially when I throw my hair into a bun like hers). There is a type of confidence you get when you know you can throw a punch or deliver a kick — that you are a little more in control of how your body moves than you were yesterday — that I wouldn’t trade in for anything. Pictured: Ronda Rousey, who defeated her last opponent in less time than it took me to write this sentence. Lately, conversations have been gravitating more and more towards the idea of me taking that next step and actually competing. I can’t pretend that this isn’t something I have been playing with for a while now. I may or may not already have my walk-out music planned out (let be real — I have. Before I even started going to the gym, I had), but there’s a world of difference between imagining what you would do in the ring and … y’know, actually being in the ring. With someone who actually wants to kick your face off. Yesterday, my coach told me that, really, my next step towards competing is learning to be okay with pain and injuries — dislocated toes, nasty bone bruises, broken noses, etc, etc, and so on, and so forth.